I’ve spent a couple of afternoons this week finishing up Mass Effect: Andromeda, dropping in and out of the sidequests that I didn’t hit while writing my review . At this point, only a few rocks go unscanned in the far corners of Heleus, and the chatty crew of the Tempest have relaxed into their late-game idle states. The feeling I’m left with is overwhelmingly positive—an uncertain start has given way to investment and enjoyment, which is a process that I’ve been through with every other Mass Effect game. The series has always struggled with beginnings and endings, but has never sought refuge in an easy-to-replicate template. Each game was differently flawed, but made great by everything that came before and after. Andromeda is no different. Although its inconsistency holds it back from excellence, Andromeda gets many things right. More than that, it has made me look forward to future games in this setting. That’s crucial. Making me invest enough in Heleus to want to return was the bar I wasn’t sure Andromeda would, or could, reach. Yet it has. In its closing moments, Andromeda made me feel the way I felt when I finished Mass Effect 1 for the first time. It’s worth dwelling on the legacy of that first game, because it’s an important influence on Andromeda’s open world structure and RPG systems. Mass Effect 1 also had a lot of the same problems: it was technically ambitious but ugly in places, it struggled under the weight of systems that didn’t quite gel together, and it relied on players being willing to accept abrupt changes of pace. Mass Effect 1 was where you met Garrus, but Mass Effect 2 is where he picked up a cool scar and became your best friend. 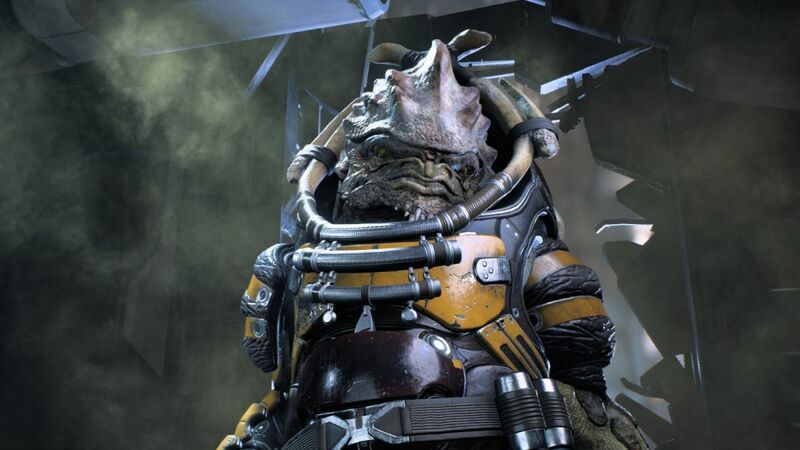 Most of what is memorable about that first game is remembered because of its importance to the sequels—Mass Effect 1 was where you met Garrus, but Mass Effect 2 is where he picked up a cool scar and became your best friend. Otherwise, highlights like the mission on Virmire and the fantastic finale have stuck in the memory while hours spent flinging the Mako over jagged hills have not. History has ultimately been kind to a game that divided critics, for good reason, when it was released. Mass Effect 2 was where Shepard’s journey really began for many players, and it marked the transformation of the original’s strange RPG-shooter hybrid into a much more readily marketable form. Mass Effect became a cover shooter with conversations. Huge explorable worlds were left behind, replaced by better-crafted linear levels. The series moved away from (relatively) hard sci-fi towards character-driven drama that followed the rule of cool. Shepard assembled a crew made of up of the deadliest, the funniest, the sexiest people in the galaxy. Returning cast members gained scars and edgy new attitudes. It was a vastly successful change, without which the series would not be remembered as fondly as it is. Even so, it’s worth remembering that the process that created Mass Effect 2 was fundamentally about excision. It was about a studio deliberately stepping away from its most ambitious ideas rather than fix them. Doing this successfully takes self-awareness and skill, but I’ve never quite been able to shake the feeling that something was lost. Although I’ve very much warmed to it since, I was tremendously disappointed by Mass Effect 2 when I started playing it. Although I’ve very much warmed to it since, I was tremendously disappointed by Mass Effect 2 when I started playing it. Celebrity voice actors, self-conscious edginess, and simplification from top to bottom? On paper, it sounds like a nightmare—what you fear will happen when a beloved developer is swallowed up by a major publisher. Yet Mass Effect 2 is now widely considered to be the moment that the series came into its own. Mass Effect 3, in turn, is a remarkable game but one that only works because of the groundwork laid by its predecessors. It is a string of finales to plotlines established in other games. If Mass Effect 1 is defined by invention and Mass Effect 2 by reinvention, then Mass Effect 3’s job was to consolidate everything that came before it into a coherent whole. It had to reach out to every character and every plot point that the first two games had thrown up into the air, catch them, and find a place for them in a story that had to also stand on its own merits. Despite the ire that has been directed at its final ten minutes, it is astounding that it gets as close as it does to pulling the whole thing off. Five years later, Andromeda was never going to match the impact of Mass Effect 3. How could it? It took two full games of setup, of invention and reinvention, in order for the end of Shepard’s journey to mean as much as it did. What Andromeda does do—and what I increasingly admire it for—is look back across the entire original trilogy while laying the groundwork for what comes next. It learns lessons from each of these impressive but individually imperfect games and carves out its own (impressive and imperfect) identity. It inherits Mass Effect 1’s sense of scale but applies greater craft to the creation of a smaller number of worlds, reconciling the ideal of explorable sci-fi spaces with the quality bar set by Mass Effect 2 and 3. From Mass Effect 2 it takes loyalty missions and the importance of vibrantly-drawn companions, although it also moves away from pure rule of cool when determining who those companions should be—they’re overall a more believable bunch. From Mass Effect 3 it adopts the idea of giving the player galaxy-spanning influence, but strips out the abstract ‘effective military strength’ rating and relies on subtler, more analogue-feeling consequences to express the effect of your choices. This is a series that is defined by reinvention, and it has reinvented itself again. Then there are the things that Andromeda gets right in and of itself. It’s the hybrid of RPG and shooter that the original game wanted to be but fell short of. Its character writing, particularly Ryder and his or her companions, reflect a decade of progress since the first Mass Effect. BioWare’s writing has matured tremendously, relying less on overfamiliar companion archetypes and operating with greater nuance and humour. The spirit of beloved Mass Effect 3 expansion Citadel is very much present here, particularly in the game’s latter stages. It looks, for the most part, phenomenal, and although its animation failings are well documented there are, equally, moments when the benefits of a new engine are keenly felt. Put it this way: it’s got some of the worst animation in the series, but also some of the best. What this all adds up to is a new Mass Effect game with an identity as distinct as any previous game in the series, and one that establishes the groundwork necessary for there to be more games after this one. It has too many flaws, too many gripes and inconsistencies to register as a classic. Yet all I can think as I step away from the Tempest after almost eighty hours with the game is that the first Mass Effect had flaws too, and Andromeda is better overall. This is a series that is defined by reinvention, and it has reinvented itself again. Andromeda 2, if it comes, would be an opportunity for that process to continue. I hope it does.